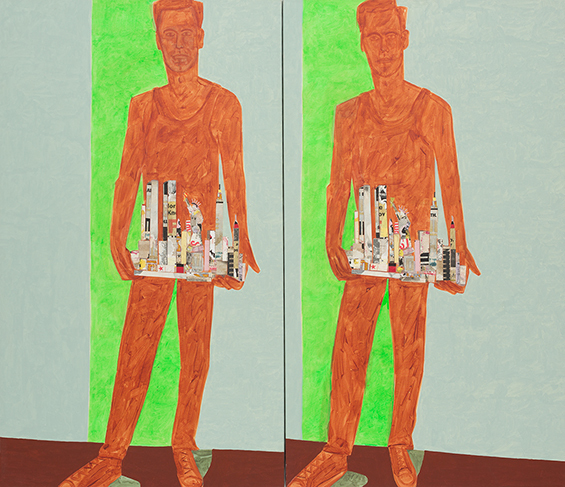 Jon Campbell, The weight of Manhattan, 1991, acrylic paint, collage, cottonduck 183 x 213 cm; 2 panels. Courtesy the artist and Darren Knight Gallery, Sydney. Photo Simon Hewson. Exhibition until 7 November. When censorship reared its ugly head at this year’s Ubud Writers and Readers Festival, it caught everyone off guard. ‘Surprising’ and ‘a new code of behaviour’ were how festival founder and director Janet DeNeefe phrased the pressure from the Balinese police to cancel events about the 1965 communist purges. ‘I had not imagined,’ wrote Vannessa Hearman—historian and moderator for one of the cancelled sessions—‘after 17 years of democratic rule in Indonesia, and a year after the euphoric celebration of President Joko Widodo’s election, that the government would resort to crude tactics of silencing those speaking about the massacres in front of an international audience.’ Other reports and opinion pieces on the incident expressed similar astonishment, calling the suppression ‘unexpected’, ‘deeply shocking’ and ‘a huge step backwards’, and a disturbing throwback to the repressive Suharto regime. In short, surprise was universal; and for good reason. There was the fact that the censorship was oddly haphazard. One of the books whose launches were cancelled — Eliza Vitri Handayani’s From Now On Everything Will Be Different (book title irony not intended) — isn’t really about 1965 at all. There was the fact that the censorship made no real practical difference. Books dealing with the 1965 killings have been appearing for a while without any attempt to ban them: just to name a handful, Leila S. Chudori’s Pulang, Laksmi Pamuntjak’s Amba, several of Ayu Utami’s novels; Sitok Srengenge’s Menggarami Burung Terbang; and a new, de-bowdlerised version of Ahmad Tohari’s Ronggeng Dukuh Paruk trilogy, originally published in the eighties but heavily censored because of its 1965-related content. But perhaps the ‘fact’ that made the whole affair most surprising, as indicated by repeated references to the Suharto regime in news and opinion articles about Ubud, was that we all thought Indonesia was supposed to have long moved past this kind of censorship. Suppression of free speech? Preventing any criticism of government-sanctioned historical narratives? How passé. How terribly and terrifyingly pre-1998. Lest I stand accused of making light of the matter, I should add that I was as horrified as everyone else. (Humour is the refuge of the helpless.) And like everyone else, I too was reminded of a past Indonesia — the one in which I spent my childhood and early adolescence, when there seemed to be very little that wasn’t verboten; when not only anything hinting at criticism of the government or its avowed ‘truths’ was subject to suppression, but also anything deemed immoral or pertaining to a cluster of supposedly sensitive topics labeled ‘SARA’—suku, agama, ras, antargolongan; in English: ‘ethnicity’, ‘religion’, ‘race’, and vaguest of them all, ‘intergroup relations’. Then again, upon further reflection, one realizes that this isn’t really the first time post-1998 when we’ve been surprised by censorship. Take the censorship still overshadowing the provinces of Papua and West Papua. Despite the president’s promising announcement in May that the province was now open to foreign journalists, their activities continue to be monitored. More importantly, restrictions on freedom of expression by local journalists remain in place. Take the vigilante censorship enacted by religious groups to whom state authorities turn a blind eye, like Front Pembela Islam (Islamic Defenders Front). And take the restrictions placed by Jakarta’s governor on public demonstrations in the capital just a few days ago. Closer to the subject at hand, take the rash of repressions surrounding 1965-related activities, of which the Ubud Festival censorship was part: the destruction of a special 1965-themed issue of the university student magazine Lentera and the deportation of a former political exile for visiting a victims’ mass grave. Excuse the desultory history of post-1998 censorship I’ve cobbled together here, but hopefully it provides some substantiation for my point, which is this: should the censorship at Ubud really have surprised us that much at all? Perhaps the question that Ubud should prompt Indonesians and those who follow Indonesian affairs to ask is not ‘How can such censorship be happening?’, but rather, ‘Why are we shocked anew whenever censorship like this happens?’ The answer to this new question may lie in the bifurcated narrative many of us rely on when thinking about recent Indonesian history. The narrative goes something like this: between 1965 and 1998, Suharto reigned as president-dictator over a repressive regime called the New Order. It was a dark time for all, writers and artists included. Writers perceived to be threats were warned, or imprisoned, or killed: Pramoedya Ananta Toer was exiled and his books banned; the activist-poet Wiji Thukul went missing. Other writers who dared to express dissatisfaction with the regime — for example, poet and dramatist W.S. Rendra; writers and journalists Seno Gumira Ajidarma, Goenawan Mohamad, and Ayu Utami — did so at great risk and cost. Then in 1998, a miracle happened. Democracy triumphed. Suharto was forced to step down. The New Order was old news — the Reformation reformed it. Sayonara, darkness. Good morning, sunshine. Don’t get me wrong. The story, I believe, is overwhelmingly true. Where censorship was once a constant companion, nowadays it pops in occasionally for an uncomfortable conversation over tea… or to drag you off to jail. At least you can express your disgruntlement about it. Or if you’re too shaken up (or still in jail), other people can be indignant on your behalf. But the tidiness of this tale, its division of the history of censorship into two neat halves—its reign and demise—belies the unpleasant reality that those in favor of the censoring are not only still around, but still in positions of power, or else still able to get those in power to acquiesce to their wishes. Laksmi Pamuntjak hits the nail on the head when she writes about her chilling realization of the ‘darker, older supervising power’ that has remained watching in the shadows all this time. I’d even dare to go further and say that, if this is the case, what we are witnessing is not a return to darkness, but rather, accumulating evidence that we may have never really left it—that ‘Lull’ rather than ‘Reformation’ may be a more appropriate term for the history of freedom of expression in Indonesia between 1998 and now. Censorship is dead. Long live censorship. Farman’s usage of the Suharto-era-coined acronym, along with his lamentation of what literature has come to (under the Suharto administration, people were encouraged to think of literature as timeless, apolitical, and a repository of moral values), imply that the Suharto era’s namesake may be gone, but Suharto-era attitudes still remain. Indeed, this was one of the many horrifying things brought to light by Joshua Oppenheimer’s documentary about the 1965 massacres, The Act of Killing: the killers are not only alive and kicking; they’re still in charge—in the underworld, in the military, and in the government. It was Oppenheimer’s belief in the continued prevalence of these attitudes that prevented him from submitting the documentary to the Film Censorship Institute for approval. This belief was apparently justified: his follow-up documentary The Look of Silence, which Oppenheimer also refrained from submitting for approval, was banned by the institute anyway. It would be so much easier on the spirit if the battle over freedom of expression in Indonesia really was a battle between goodies and baddies that the baddies lost years ago. We want desperately to believe that the baddies have been vanquished—that they’ve been reformed, or ousted, or have conveniently vanished, or that there weren’t really that many baddies to begin with and that it was the climate of the Suharto regime that made them into baddies when deep down they were actually good. It’s probably this desperate belief—in Indonesian history as a determined and eventually successful march towards greater civil liberty—that preserves its adherents from complete despair. But the reality seems to be that the baddies are around, still baddies, and that according to them, it is the presumptuous ‘we’ I’ve been using throughout this essay who are actually the bad apples.